According to statistics from the City of Omaha, over 67,000 cars pass through the intersection of Maple and 83rd Streets every day. If you happen to be one of the motorists who travels this route, be certain to pay special attention to the billboard overlooking this junction. Beginning this spring, New York-based artist Mathieu Borysevicz will use the billboard positioned at this crossroads to explore how large-scale advertising images affect our personal space and visual perceptions. His project Untitled (Omaha, Nebraska) is in collaboration with the Bemis Center for Contemporary Arts and is made possible by funding from the Nebraska Arts Council and LAMAR Advertising and a generous grant from the Nimoy Foundation. Borysevicz will unveil his project in late April, and it will run for four weeks through the end of May. Whether by foot or car, bus or bike, Mathieu Borysevicz offers a literal and figurative crossroads for commuters. 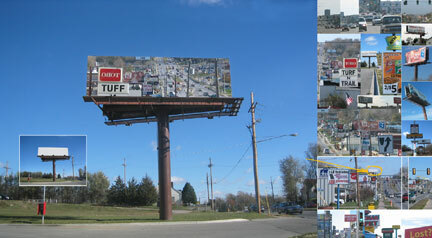 Make Untitled (Omaha, Nebraska) at Maple and 83rd Streets your next destination and consider how ordinary intersections intersect with our everyday lives.